Feeling down? Try vitamin D, some studies suggest. Wary of flu or multiple sclerosis? Overweight? Try vitamin D, other studies suggest. Vitamin D, the "sunshine vitamin" that helps prevent osteoporosis by building and maintaining muscles and bones, has in recent years also been at least tentatively credited with helping to prevent or treat a host of other problems. The word has spread from friend to friend, from doctor to patient, on TV and online. "The Dr. Oz Show" -- responsible for what the nutrition industry calls "the Dr. Oz effect," in which sales spike after the TV doctor mentions a product -- has touted vitamin D as a cancer fighter and fat melter. Dr. Lynn Kohlmeier, director of Spokane Osteoporosis and Endocrine Associates of Spokane, is a vitamin D proponent, working to educate residents about connections between the vitamin and healthy bones and muscles. Vitamin D supplementation has been shown repeatedly to reduce the risk of falls among older adults. When it comes to research in early stages linking vitamin D to other health problems, "I think it's good to be skeptical," she said. "A lot of those claims have not been proven." Even so, many researchers and patients see a lot of promise in vitamin D. In the face of that promise, more people facing potential vitamin D shortages -- a result of lifestyle and location -- are boosting their levels with supplements. How much to supplement remains subject to debate. One online clearinghouse, www.vitamindandms.org, cites dozens of studies suggesting the vitamin may prevent or delay multiple sclerosis. The National Cancer Institute doesn't take a position on using vitamin D supplements to reduce cancer risk. But it does note some studies have linked higher vitamin D levels with lower risks of colorectal cancer; it's unclear whether the vitamin is associated with reduced risks of other cancers, the institute says. "I started taking it and noticed differences almost immediately," said Pat Dougherty, a chiropractor who encourages his patients at North Central Chiropractic to take vitamin D supplements. "The first things I noticed almost immediately were clarity and more energy." Diane Markley started taking vitamin D supplements 40 years ago on her doctor's advice. "He was kind of ahead of his time," Markley said. For most of us, supplements offer the easiest path to vitamin D.
Otherwise, humans get it mostly through exposure to the sun and a few foods. But it's cloudy out there. Even when it's sunny, the region's northern latitude means the light that reaches us contains less-powerful ultraviolet rays. "There's a lot of people in the Northwest that have low levels," said Dr. Paul Skrei, a family physician and medical director at Group Health's Lidgerwood Health Care Center in north Spokane. But what's considered low is up for debate, he said. That also goes for what's considered normal, which depends on what lab you're in, what journal you're reading -- or where you live, he said. Consider oxygen, Skrei said: People breathing air at sea level will have different "normal" oxygen levels than someone breathing in Denver. The body adjusts to current conditions. The Institute of Medicine said in 2010 that practically everyone needs 20 nanograms of vitamin D per milliliter for good bone health. The nonprofit organization advises the government and others on health issues. Skrei said he's had a lot of patients ask to be tested in recent years, and he's found levels from 15 to 47 nanograms per milliliter. But those results can be complicated to interpret -- especially compared with the Institute of Medicine's recommendations, which drew flak from researchers and doctors who said its guidelines for daily vitamin D intakes and healthy levels were too low. "It's debatable now, but I would say most of the osteoporosis and calcium specialists feel that deficiency is less than 10," said Kohlmeier, of Osteoporosis and Endocrine Associates. "No one's going to argue about that. That's severe deficiency. 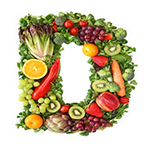 Vitamin D insufficiency is less than 20. But ... despite the Institute of Medicine publishing that 20 was good enough and that should be our goal, osteoporosis and calcium experts really feel a level of 32 to 40 is where we should shoot for." Assuming minimal sun exposure, the organization also said a daily dose of 600 international units, or IUs, of vitamin D meets the needs of almost everyone in the U.S. People 71 and older may need as much as 800 IUs a day, the organization said. It offered an upper limit of 4,000 IUs a day for most people 9 or older. Kohlmeier said she often advises patients to supplement with 2,000 to 5,000 IUs a day. There's such a thing as too much vitamin D. It's a fat-soluble vitamin, stored throughout the body. Water-soluble vitamins, on the other hand, dissolve in water and are discharged through the kidneys if you have too much. "Vitamin D toxicity is real, but it's hard to become vitamin D toxic," Kohlmeier said. "You'd have to take over 10,000 (IUs a day) over a long period of time. I don't like people taking more than 6,000 a day." Scott League, general manager of Spokane-area Mother's Cupboard stores, said he doesn't put much stock in the Institute of Medicine's numbers. "I think typically the government is very conservative when it comes to supplements," League said. Recommended "daily values" of vitamins and nutrients reflect amounts required to prevent severe health problems, not necessarily maintain optimal health, League said. His stores carry jars of 10,000 IU soft gels, along with smaller daily doses. League takes 5,000 IUs a day, he said, and gives his 6-year-old daughter about 2,000 a day. Rather than exact numbers, Skrei said what's most important is the difference between insufficient levels and deficient levels. Deficiency is "something that's causing symptoms or a medical condition." That's often osteoporosis, whose symptoms before bone fracture are vague -- general muscle weakness or aches, achy bones, maybe sore shins. These days, if Skrei suspects an insufficiency, he usually skips the blood work. He said most doctors agree that's the way to go, unless they suspect a patient needs more supplementation than normal. People at risk of deficiency include nursing-home residents who rarely go outside, bariatric-bypass patients, and people with celiac disease or ulcerative colitis. In general, Skrei said, "It's much safer and easier to tell people, 'Whatever your diet, if you're a normal adult, take 800 units a day with calcium. Just supplement your diet, rather than worry about the levels.'" That view follows a period of a lot of blood testing, as word spread among patients of the vitamin's potential roles throughout the body. "Vitamin D was one of the most common, maybe over-ordered, lab tests in 2011 and 2012," Kohlmeier said. She doesn't need a test to tell her pretty much everyone should have more of it. Kohlmeier said she skips testing unless the patient has been taking at least 800 IUs a day for a couple of months. Without taking supplements, "they're going to be low," Kohlmeier said. Skrei said he doesn't know why vitamin D would make someone feel more energetic, for example. But "if you're taking something and it makes you feel better and it's not dangerous," go for it, he said. "Take it for a month. If you feel better, then don't worry about the dose or the level," Skrei said. "Take a little more, and if you continue to feel better, that's fine. If you take it for a month and you don't feel any different, then you can decide if you want to continue doing it or not."